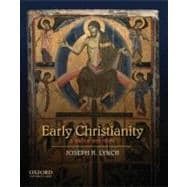 This concise and engaging introduction to the history of early Christianity examines the development of Christianity from its origins up through the year 620. Accessible to beginning students with no background in the subject, Early Christianity: A Brief History is also captivating reading for more advanced students. The book is organized chronologically into four parts: The Contexts of Early Christianity, Christianity in the Second and Third Centuries, The Creation of a Christian Empire, and Life in the Christian Empire. Each part begins with a timeline in order to guide students in the chronology of events. Opening with a look at the historical Jesus--which considers what we know and how we know it--the book continues on with coverage of the Jewish and Roman worlds in which Christianity arose. It then charts the extraordinary progress of Christianity, ranging from its status as a fringe sect in Judaism, to that of a dominant religion, up through the reign of Pope Gregory I. Chapters on society and culture and an epilogue on Muhammad and the rise of Islam are also included. Focusing on important themes and developments throughout, author Joseph H. Lynch does not overwhelm students with an encyclopedic amount of detail. In addition, he acknowledges the often neglected diversity of early Christian views without losing sight of the major lines along which the religion developed. Lynch integrates excerpts and quotations from a wide variety of ancient sources--including the New Testament, the Gospel of Thomas, the Didache, and the writings of Dio Chrysostom, Fronto, and Tactitus--in order to engage students and show them how historians learn about the ancient world. Each chapter ends with carefully selected suggestions for further reading that are drawn from both ancient and modern sources. The book also features custom-drawn maps and photos to help students understand the visual and geographical developments of ancient Christianity.